Kitty Cover is a microgame that appears in the Nature folder in WarioWare, Inc.: Mega Microgame$! for the Game Boy Advance. It returns in WarioWare Gold, this time hosted by Mona. 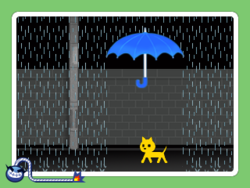 The player controls a blue umbrella and must cover a yellow cat to protect it from the rain until the time runs out. If the player does so, he or she wins the microgame. 1st level difficulty: The umbrella is wide. 2nd level difficulty: The umbrella is narrower. 3rd level difficulty: There is wind blowing the rain to the left. The umbrella is narrow and set diagonally. In its WarioWare Gold remake, the cat is sometimes replaced with a tiger cub. The microgame reappears in Super Smash Bros. Brawl, Super Smash Bros. for Nintendo 3DS, and Super Smash Bros. Ultimate as one of the different microgames that appear in the WarioWare, Inc. stage. 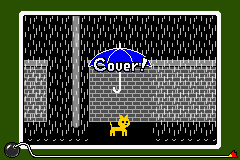 In these games, the object is to remain under the umbrella along with the cat and only if the character successfully remains under the umbrella the whole time will they get a prize. Also, the rain causes small damage. This page was last edited on March 14, 2019, at 14:49.